Asus ROG has launched a pair of new motherboards for AMD’s Socket AM4. These boards will appeal directly to those wishing to build compact AMD Ryzen systems as they are both Mini-ITX form factor – 6.7-inch square motherboards. Asus admits that “Mini-ITX boards are among the most difficult to produce,” however it claims to have raised the bar for small-form-factor Ryzen builds with the new products, which pack in ROG niceties like liquid- cooling readiness, addressable RGB lighting, an M.2 SSD heatsink, and amped-up audio. The new motherboards are the Strix X370-I Gaming and Strix B350-I Gaming. With Ryzen processors being open to overclocking for anyone, Asus has implemented the same six-phase VRM design as on its full-sized ATX boards for AM4. Those interested in overclocking can make use of Asus 5-Way Optimization technology, which is also referred to as an ‘intelligent auto-tuner’. It facilitates one click overclocking for novices but at the same time can quickly find a baseline for veterans to work from for more aggressive overclocks. With the typical tight confines of a Mini-ITX chassis in mind, Asus has configured the three fan headers for 2x air fans and 1x LCS. All the headers take input from multiple heat sensors around the motherboard. Asus explains that in order to cram in all the features it wanted to, in these Mini-ITX motherboards, it custom designed a small riser PCB. On the Strix X370-I and B350-I Gaming the riser accommodates both the M.2 SSD heatsink and Supreme FX audio. 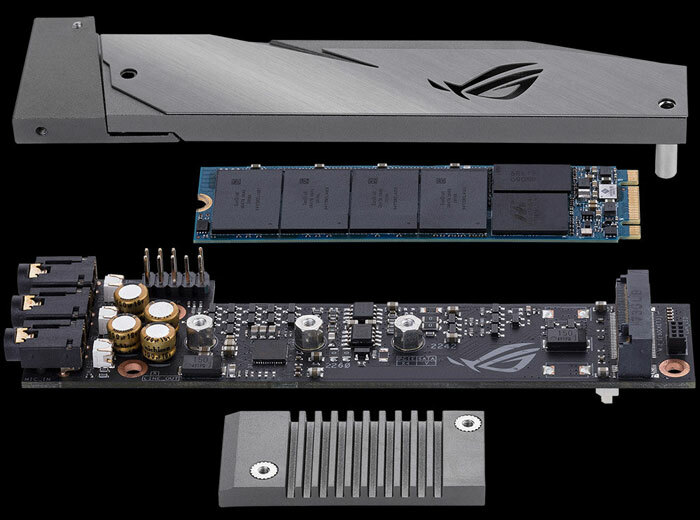 Built-in audio is particularly important for SFF motherboards as there isn’t the expansion capacity for add-in audio cards, notes Asus. Asus has yet to announce pricing and the precise availability dates for the Strix X370-I Gaming and Strix B350-I Gaming motherboards. However, we do know that the boards will start to become available later this month in the US. Despite AMD building an SoC that can run without a supporting chipset (under the A300/X300 branding), meaning that you don't actually *have* to cram any additional components on the board? I get that some people want bells and whistles SFF boards, but it's getting depressing that we haven't seen a single board making use of the fact that chipsets are optional for Ryzen…. The WiFi and Audio (assuming it's any good - any information about it?) and GigE (why didn't AMD expose that from the Ryzen die?) are nice to haves of course. Shame there's no USB Type C ports, especially with the gap on the rear I/O area. And what, no DB25 Serial! …GigE (why didn't AMD expose that from the Ryzen die?) are nice to haves of course. Probably because Intel NICs are best in class. If they wanted to do it on die they would either have to license intel tech leading to exposure of amd processor development or make their own NIC infrastructure. No video outputs, so you can't use the IGP if you put an APU in one of these. Nice spot, that's exactly the kind of thing people would want to do with a board this size too. Why would you not have even one measly HDMI?